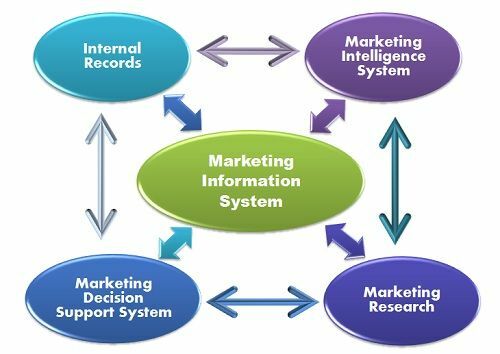 Definition: The Marketing Information System refers to the systematic collection, analysis, interpretation, storage and dissemination of the market information, from both the internal and external sources, to the marketers on a regular, continuous basis. The marketing information system distributes the relevant information to the marketers who can make the efficient decisions related to the marketing operations viz. Pricing, packaging, new product development, distribution, media, promotion, etc. Every marketing operation works in unison with the conditions prevailing both inside and outside the organization, and, therefore, there are several sources ( viz. Internal, Marketing Intelligence, Marketing Research) through which the relevant information about the market can be obtained. The information can be collected from the documents such as invoices, transmit copies, billing documents prepared by the firms once they receive the order for the goods and services from the customers, dealers or the sales representatives. The current sales data should be maintained on a regular basis that serves as an aide to a the Marketing Information System. The reports on current sales and the inventory levels help the management to decide on its objectives, and the marketers can make use of this information to design their future sales strategy. The Companies maintain several databases such as*Customer Database- wherein the complete information about the customer’s name, address, phone number, the frequency of purchase, financial position, etc. is saved. *Product Database- wherein the complete information about the product’s price, features, variants, is stored. *Salesperson database, wherein the complete information about the salesperson, his name, address, phone number, sales target, etc. is saved. The companies store their data in the data warehouse from where the data can be retrieved anytime the need arises. Once the data is stored, the statistical experts mine it by applying several computer software and techniques to convert it into meaningful information that gives facts and figures. Marketing Intelligence System: The marketing intelligence system provides the data about the happenings in the market, i.e. data related to the marketing environment which is external to the organization. It includes the information about the changing market trends, competitor’s pricing strategy, change in the customer’s tastes and preferences, new products launched in the market, promotion strategy of the competitor, etc. Providing the proper training and motivating the sales force to keep a check on the market trends, i.e. the change in the tastes and preferences of customers and give suggestions on the improvements, if any. Motivating the channel partners viz. Dealer, distributors, retailers who are in the actual market to provide the relevant and necessary information about the customers and the competitors. The companies can also improve their marketing intelligence system by getting more and more information about the competitors. This can be done either by purchasing the competitor’s product, attending the trade shows, reading the competitor’s published articles in magazines, journals, financial reports. The companies can have an efficient marketing information system by involving the loyal customers in the customer advisory panel who can share their experiences and give advice to the new potential customers. The companies can make use of the government data to improve its marketing Information system. The data can be related to the population trends, demographic characteristics, agricultural production, etc. that help an organization to plan its marketing operations accordingly. Also, the companies can purchase the information about the marketing environment from the research companies who carry out the researches on all the players in the market. The Marketing Intelligence system can be further improved by asking the customers directly about their experience with the product or service via feedback forms that can be filled online. The secondary data are publicly available, but the primary data is to be collected by the researcher through certain methods such as questionnaires, personal interviews, surveys, seminars, etc. A marketing research contributes a lot in the marketing information system as it provides the factual data that has been tested several times by the researchers. Marketing Decision Support System: It includes several software programs that can be used by the marketers to analyze the data, collected so far, to take better marketing decisions.With the use of computers, the marking managers can save the huge data in a tabular form and can apply statistical programs to analyze the data and make the decisions in line with the findings. Thus, the marketers need to keep a check on the marketing environment, i.e. both the internal (within the organization) and the external (outside the organization, so that marketing policies, procedures, strategies can be designed accordingly. IS MARKET INFORMATION SERVICE THE SAME AS MARKET INFORMATION INTELLIGENCE AND MARKET INFORMATION SYSTEM? WHAT IS THE SIGNIFICANCE AND IMPACT OF MARKET INFORMATION SERVICE IN THE AGRICULTURAL MARKETING?